I am pretty sure the majority of homeschoolers will agree with me that the library is at the top of the list when it comes to FREE resources for homeschoolers. We go to our library 1-2 times a week and generally have 50 books checked out at a time.We get check out for our themed units, holidays, bedtime. We also take advantage of the audio tapes, CD's, DVD's and VHS tapes (yup we still have one of those). And occasionally even I will through in a book or two for myself. Did you know that many of the libraries now have sections just homeschooling? This is how we organize our library books so we don't loose any. When they are done with a book it goes back into the tupperware. If it is one they don't want to read again it goes behind the return to library divider. The kids are only allowed to have the books in the schoolroom and living room that way we are less likely to loose them or damage them. In the last 3 months we have only returned books late once and owe the library 12 cents. 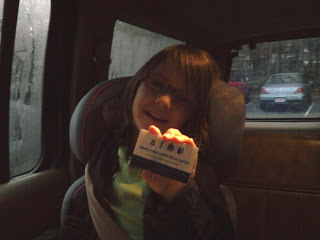 She was super excited when she got her very own library card. Our library offers programs monthly like Lego club, book club, story time, homeschool science class, rocks and minerals class, Black History presentations and special holiday activities, just to name a few. So check with yours I am sure they do too. If they don't ask them if they will start to offer more programs and then get the word out to homeschoolers in your area. I recorded this video from the Fulton County GA Government TV (basically public broadcasting) stream since we don't have cable so it isn't the best quality. My kids along with several others were filmed during Lego club last month. Lego club creation. The theme was Pirates. I am pretty sure Rowyn has a crush on the librarian, Ms Ginny (he has a thing for blondes). He always has to say hello and good bye to her and loves to chat her ear off. He also for some reason cannot call her by name instead she called is library girl. The kids love telling her about their days and enjoy drawing pictures for the kids library wall. The kids also get to meet and play with other kids (both homeschool and not) whenever we go to the library. So not only is the library good for books but it also helps their social skills. All dressed up and ready to have fun at a very pirate Christmas party at the library. The kids got to dress up, decorate cookies and had "A Pirates Night Before Christmas" read to them. We actually won a copy of the book too! And then there are the used book sales. Oh my its a homeschoolers heaven. We have gone to two so far and made out both times. Over 30 books for $12! I don't know what we would do without our library. I love that the kids enjoy going there and look forward to it every week. It brings back memories of when my mom used to take me to our humongous library in Lancaster, PA (the library was two stories, pretty sure it had a basement too). Pickens library - the one we used to visit when we 1st started homeshcooling. Roswell library - our new library. They were really excited because this was the first time visiting and we hadn't been to the library in about 2 weeks because of our move. So do you utilize your library? And what is the highest amount you have ever had in library fees? Love it!!! I am a librarian, so I love hearing that people love their libraries. I WISH we had room for a homeschool section. We are a small town municipal library. But we do offer some good programs. I love your ideas for organizing your library books. Highest amount at one time was $20 - but I've probably paid a couple hundred dollars in fees in the past few years! DVDs are killer, a buck a day overdue! @momlaur our library charges $1 as well for overdue DVD and we can only check them out for 7 days (they can be renewed though). I love the online renewal feature that really helps make sure we don't rack up fees. Definitely start a lego club its a blast. You can also sign up on lego.com for the magazine which has ideas, etc in it. Our library picks a theme and lets the kids come up with wonderful creations. As a librarian in a VERY small (and underused!) rural public library, I love this post!! 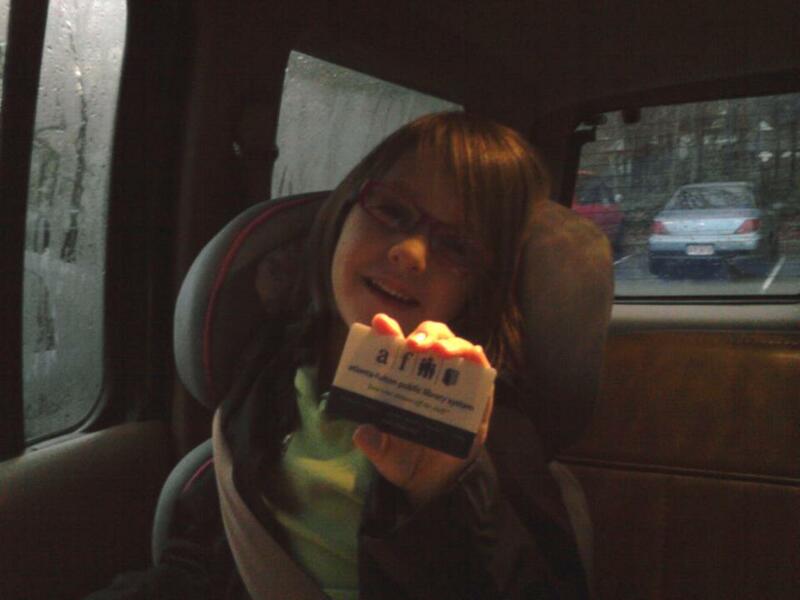 :) So glad you make good use of your library, and that your library has such good resources for you!